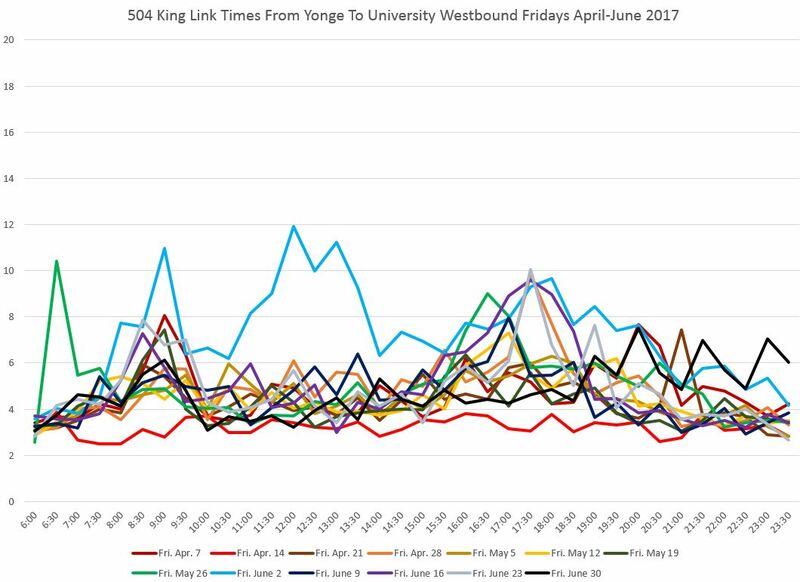 With Toronto Council’s approval of a pilot project to give more priority to transit on King Street, it is worthwhile to understand how travel times behave today, and what a “best case” improvement might look like. 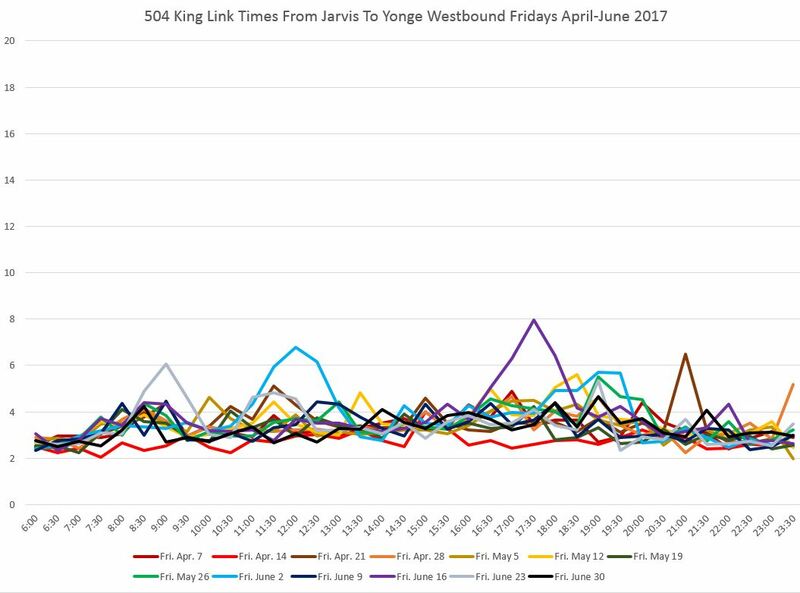 This article reviews TTC vehicle tracking data for the first half of 2017 on King to illustrate the variation in travel times for the Jarvis-to-Bathurst pilot area, smaller segments within the pilot, and the segments beyond. 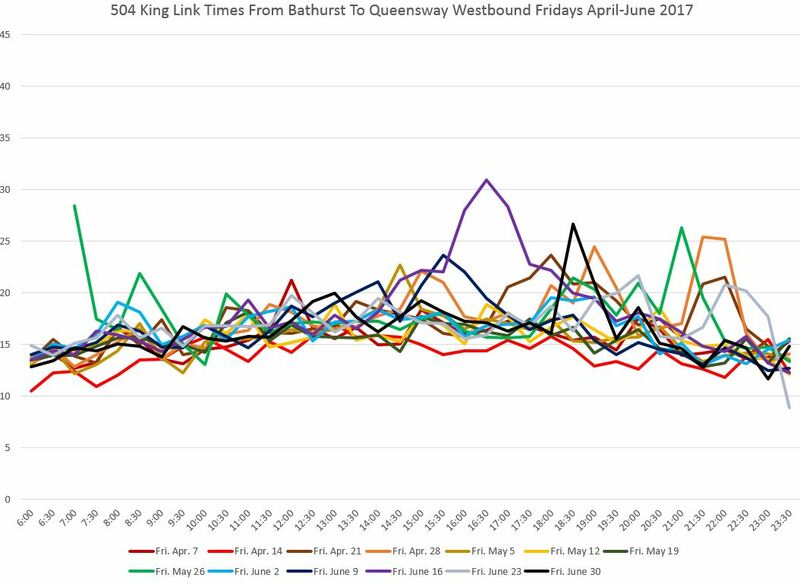 Advocates for transit priority on King routinely cite congestion and longer travel times as major issues that the pilot can deal with, and indeed journey time reduction is one of the goals of the project. 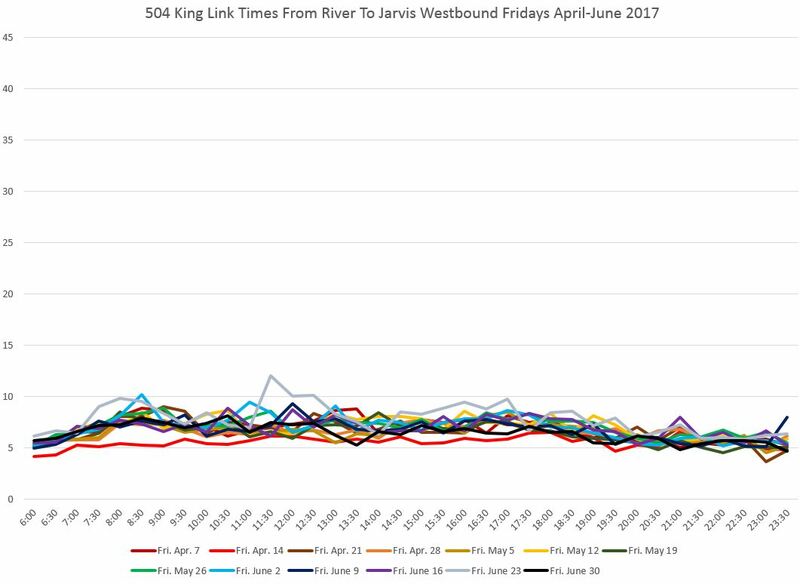 However, the 504 King service operates in a more complex environment than just a congested central section, and that context must be understood in evaluating the benefits any change will bring. Travel times vary substantially depending on the time, location, direction and day of the week. Under some combinations of these, transit vehicles move quite freely on King Street today. Variation in times is not always predictable. Shaving the peaks off of these variations and restoring reliability is an important part of making transit “run faster”. 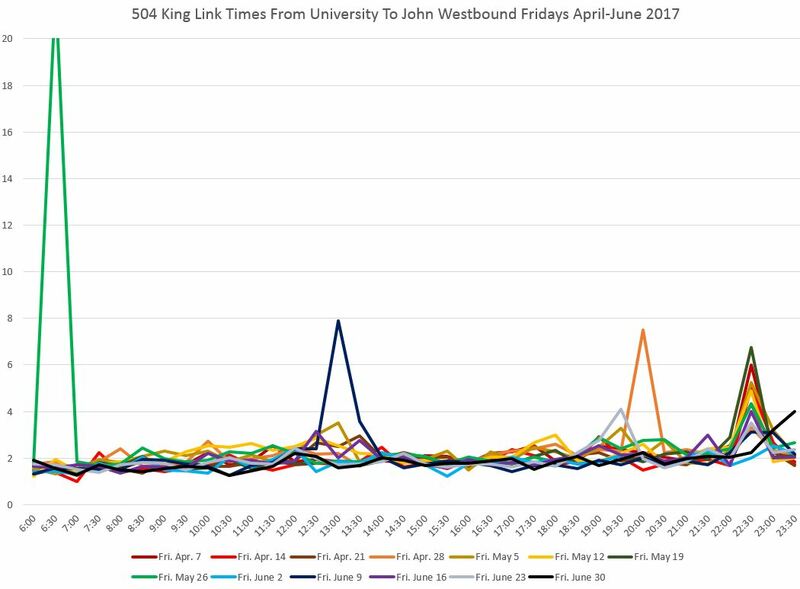 The problem is not confined to the central part of King Street, but the pattern of delays is different than downtown. Riders complain that the King car can be challenging to use, but the transit experience entails more than just the in-vehicle time from point “A” to “B”. First, one must walk to a stop and await a streetcar’s arrival. Then one must hope that there is room on the car to board. Finally one speeds (or not) along the route. Transit studies regularly find that of these factors, the time spent in motion on board is the least critical in terms of perceived trip length because, finally, the rider is “on the way”. Time spent waiting, let alone being passed up by a full vehicle (or kicked off one that short turns), weighs more heavily in the “why am I still taking the TTC” question unless the in-vehicle time is a substantial portion of the trip overall. 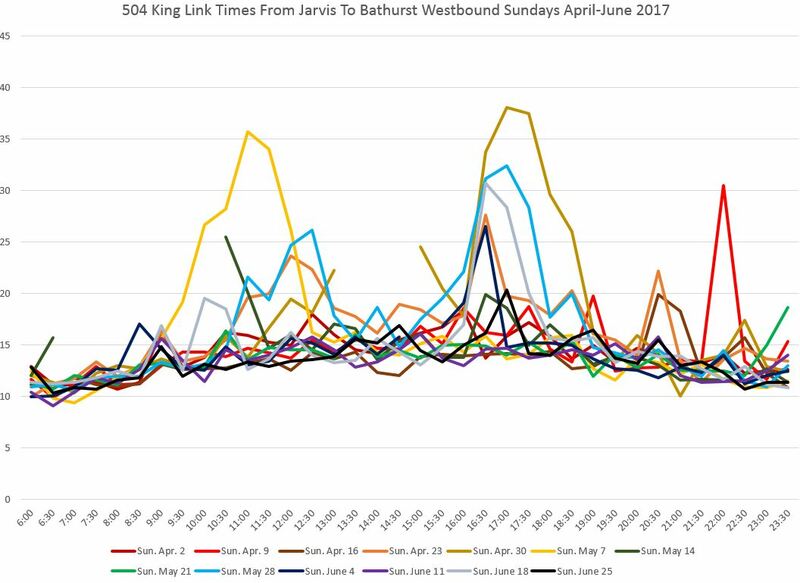 Any scheme to improve King that looks only at travel time, but ignores service reliability and capacity, will miss out on important components of what makes service more attractive, and in doing so risks limiting the potential for increased demand. In previous articles, I have reviewed the reliability and capacity of service on King Street. The TTC has no plans to add service to 504 King during the pilot, although they will begin to replace shorter cars (CLRVs) with longer ones (new Flexitys) in December. This will gradually add to capacity of the route, if not service frequency. At this point, the service design for September when streetcars will return to Queen Street has not been announced, and the degree to which buses will operate on King at least in the early days of the pilot is unknown. The bus trippers claimed by the TTC to be “supplementary” service in fact replace streetcars, generally at a lower capacity. 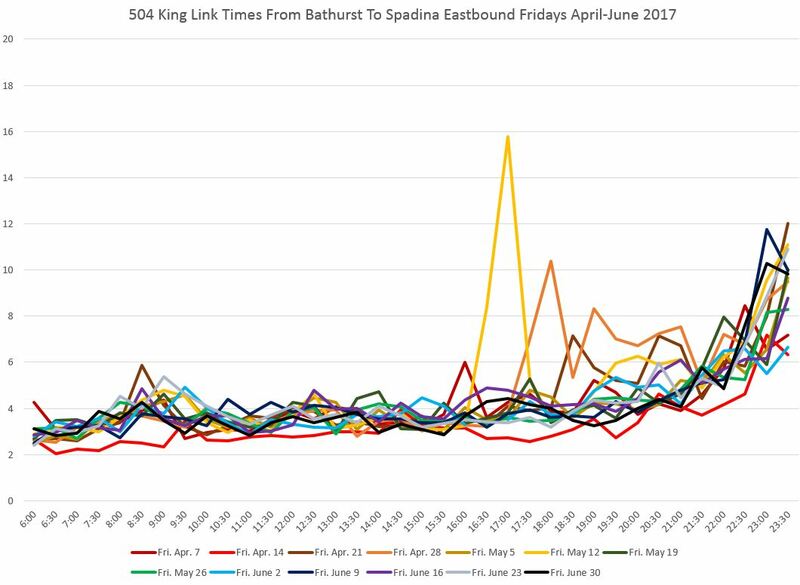 As for reliability, reduced and more regular travel times through the core will be a benefit to the King service provided that the TTC actually manages headways. 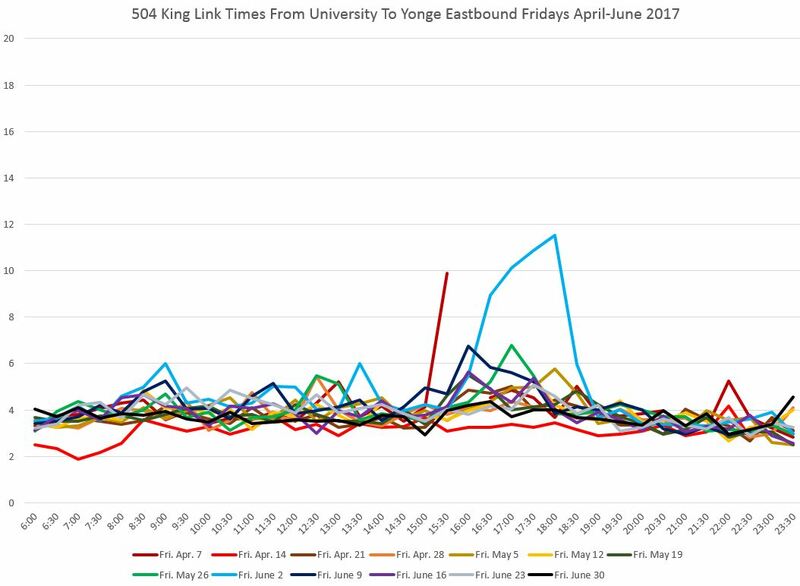 There is an ongoing problem with irregular service during the AM peak when there is little congestion as an excuse, and this irregularity plagues riders, especially in Parkdale, Liberty Village and Bathurst/Niagara. 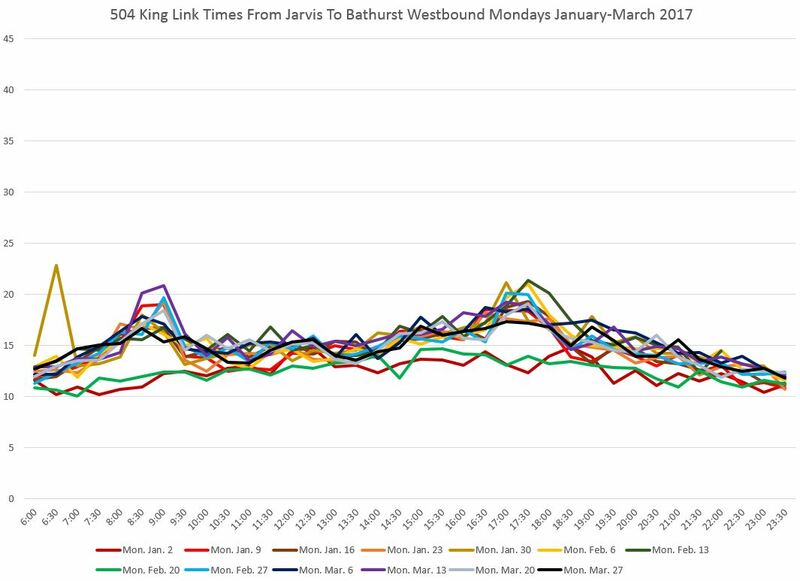 The two charts below show the travel times, averaged by half hour, for each Monday and Friday in the months of January-March 2017 westbound from Jarvis to Bathurst. Each line above shows one Monday’s data, and the values are remarkably consistent over the three months. The two outliers are January 2 (New Year’s Day, observed) and February 20 (Family Day) which were statutory holidays. By contrast, Fridays show different results particularly from the PM peak onward. (Note that Good Friday fell in April in 2017, and so there is no Statutory Holiday included here.). The situation on weekends is, of course, quite different. 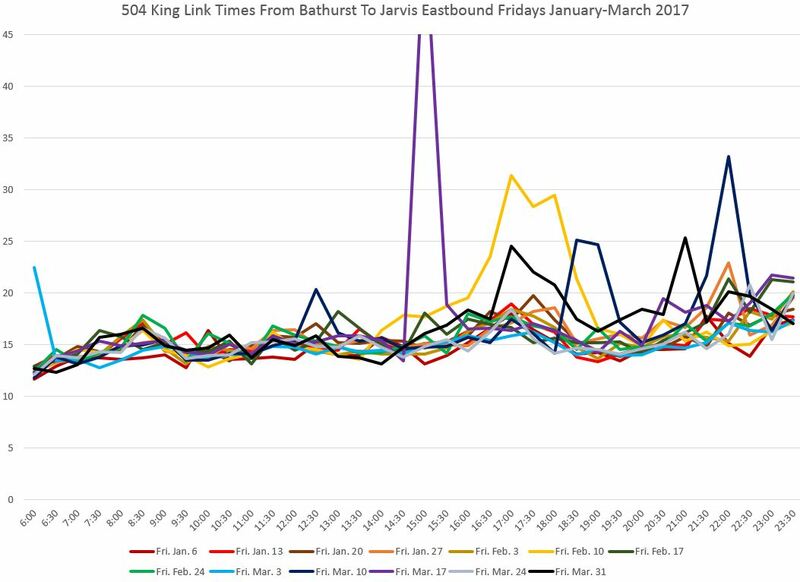 On Saturdays, travel times start out low in the morning and build through the day until the effect of congestion in the entertainment district hits at about 9:30 pm. Sundays show a different situation with a gradual buildup and down of times through the day peaking in early afternoon. Special events on a few days trigger unusually high values. 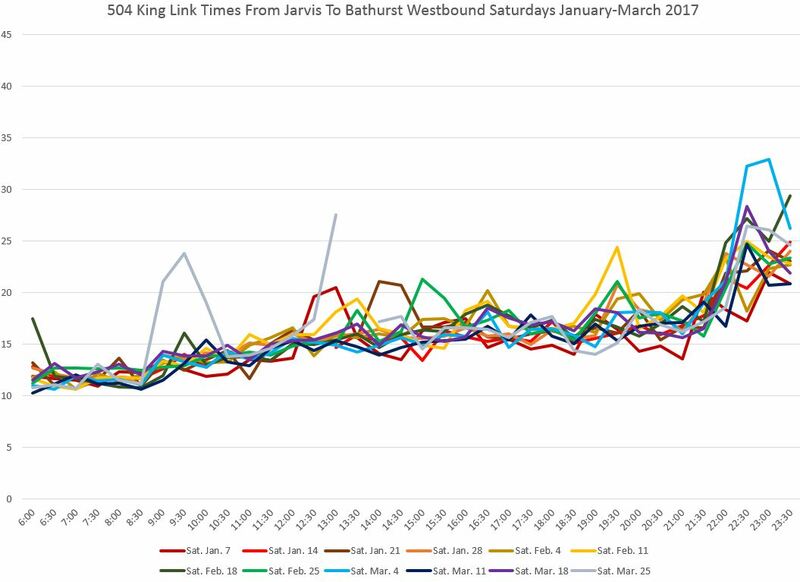 Data for eastbound cars shows a broadly similar pattern to the westbound service, but it is not the same. 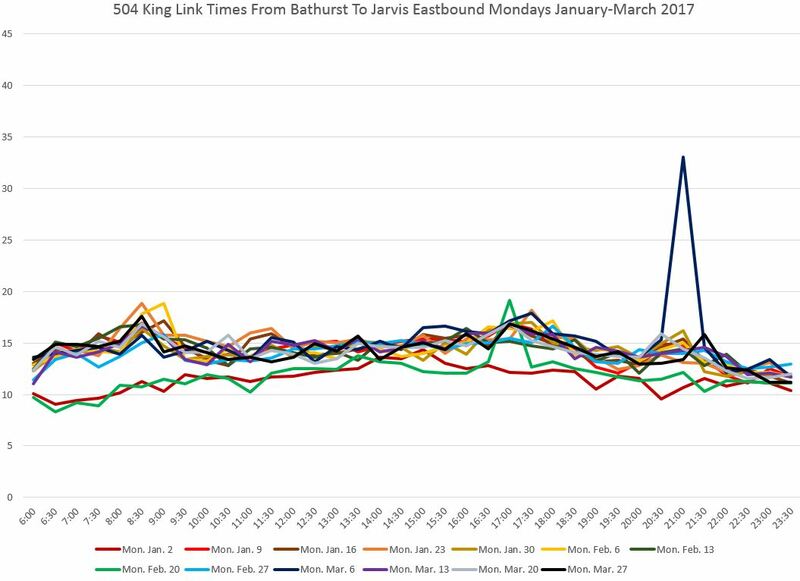 Eastbound trips show little variation over the day on Mondays with only small increases for the peak period, and no evening activity (except for March 6 when a delay stretched the average for 9:00 to 9:30 pm). 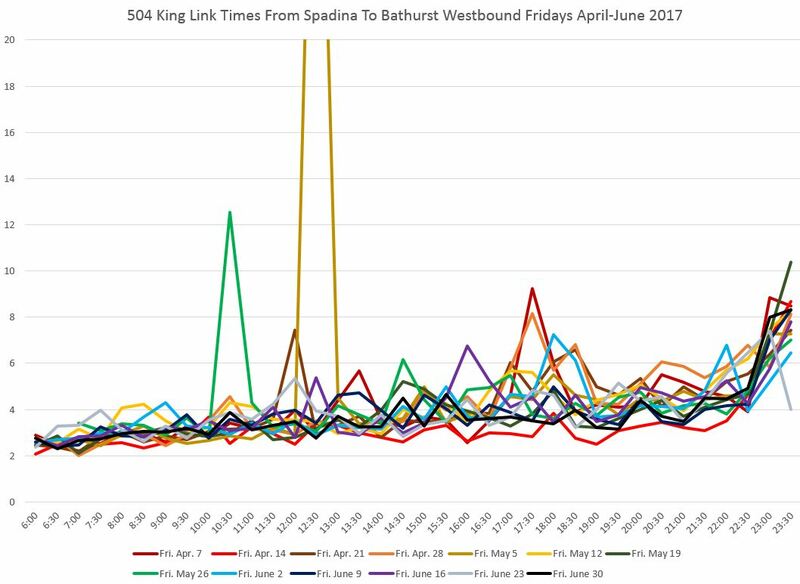 Fridays show an effect in the entertainment district, but it does not behave the same way as for westbound trips, and travel times do not rise as much as they do westbound. The data for the second quarter of 2017 is somewhat different from the first quarter with more disruptions. Some of this can arise from greater use of the street for activities such as construction and utility repairs. The very high peak on May 1 was caused by the electrical fire in a Hydro vault at King and Yonge that required all service to divert via Queen Street. 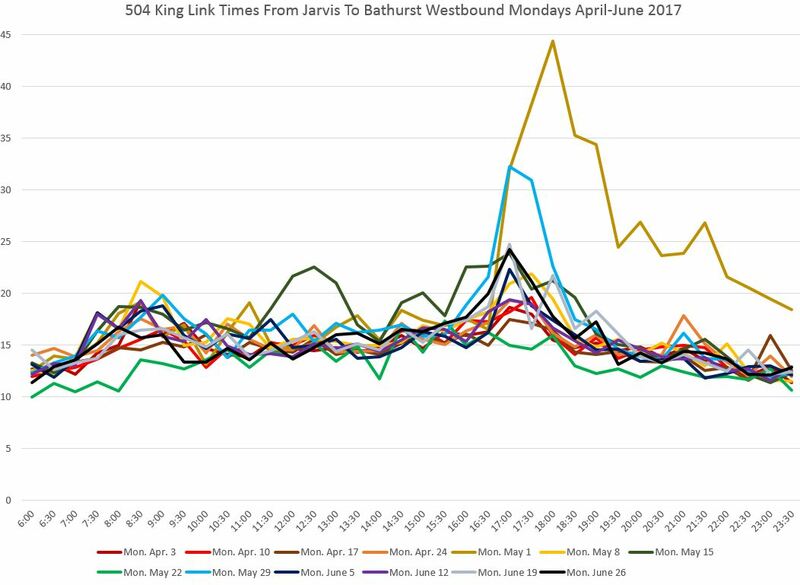 Monday May 22 was Victoria Day with slightly lower than usual travel times. 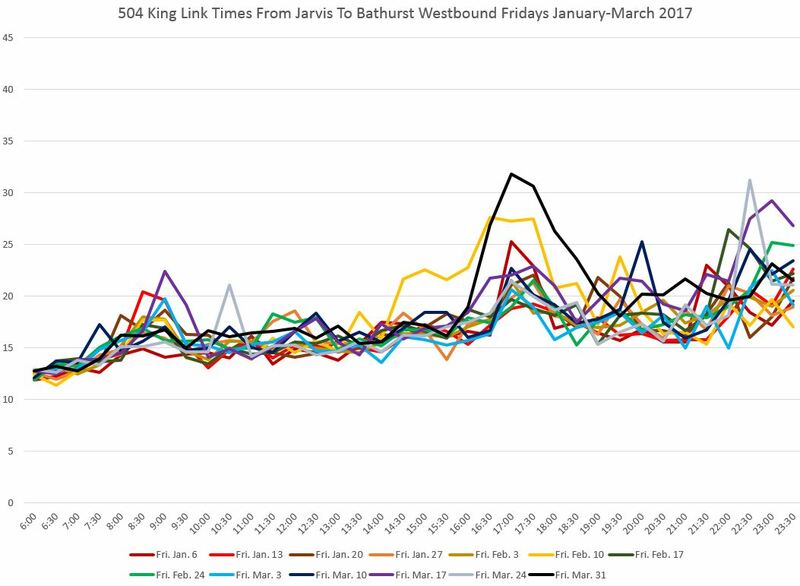 The pattern of less predictable travel times for Fridays seen in the winter data shows up here as well. 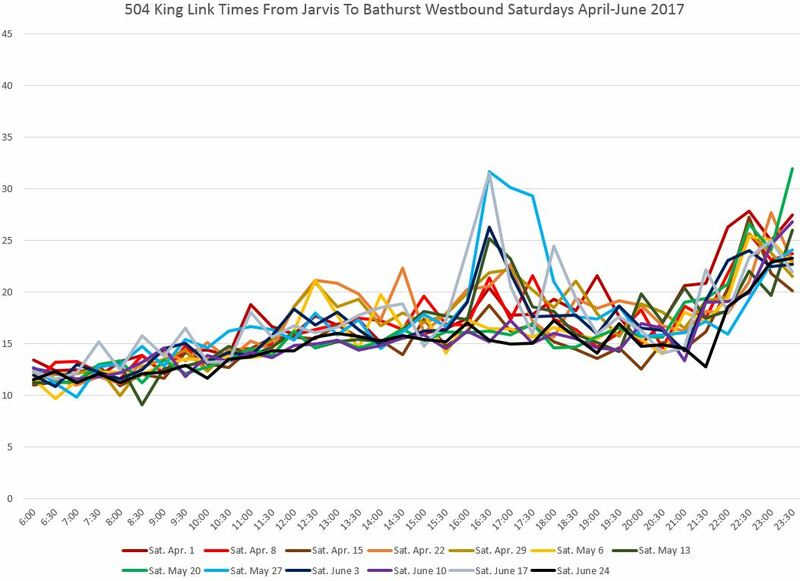 Friday April 14 was Good Friday with travel times typical for a holiday. Note, however, that it behaves similarly to other Fridays in the late evening. Saturdays show the same late evening pattern as in the winter months, but there is also a late afternoon peak for some days. Sundays in spring are even more peculiar with some late morning and late afternoon peaks, but not every weekend. These correspond, mostly, to Blue Jay home games. It is intriguing that the Sunday peaks are higher than the Saturday ones. Blue Jay weekends: April 15-16, 29-30, May 13-14, 27-28, June 3-4, 17-18. In these charts, there are two different types of peak. Some are very short and last for only one data point (that is, for a single half-hour interval on one day). Typically these are caused by some sort of blockage that extends travel times for a group of cars within the half-hour window. Some are more extended with a rise and fall over several hours, but only for one day. These are generally the result of a special event, or one-day service blockage (e.g. for construction) that reduces the road’s capacity from its usual level. 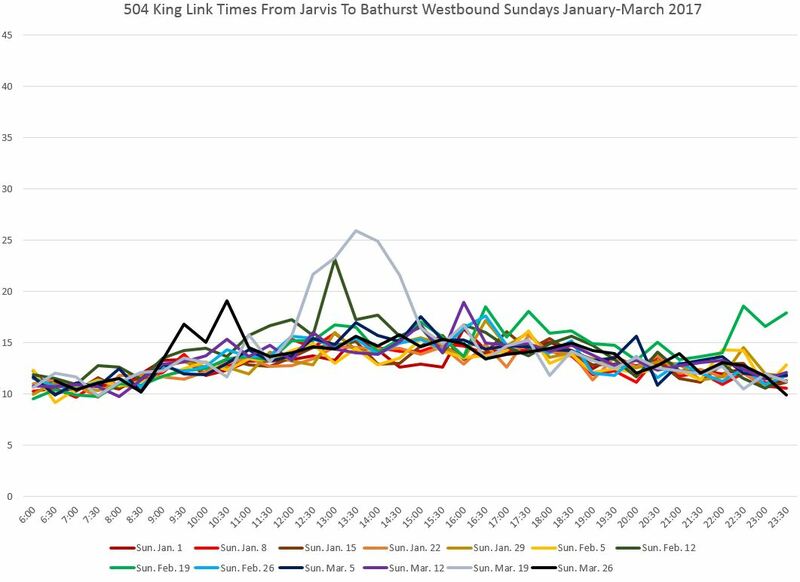 This type of event might or might not be absorbed during off-peak times by available capacity, but it can accentuate the effect of peak period congestion as on Friday, February 10 eastbound above. The following PDFs contain all of the charts for each direction and day for the first and second quarters of 2017. 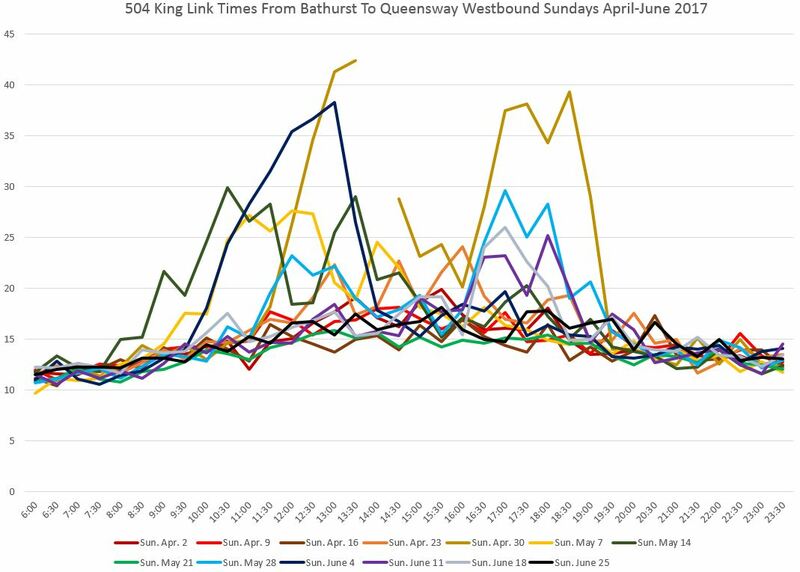 The situation west of Bathurst is far from smooth sailing for the King car. As on the central part of the route, Mondays are uneventful between Bathurst and Roncesvalles (The Queensway) westbound. Fridays are not as good as Mondays with higher travel times overall, particularly in the evening. Even weekends are not immune, and Sundays for this area were actually worse than Saturdays. And here is the full set for spring 2017. In the following section, Friday data are shown although this might not be the most irregular day of the week for each segment. Note that the vertical scale is different compared to the previous charts (max 20 vs 45). Compared with other segments of the pilot area, this portion does not see quite the wild swings especially in the evenings. 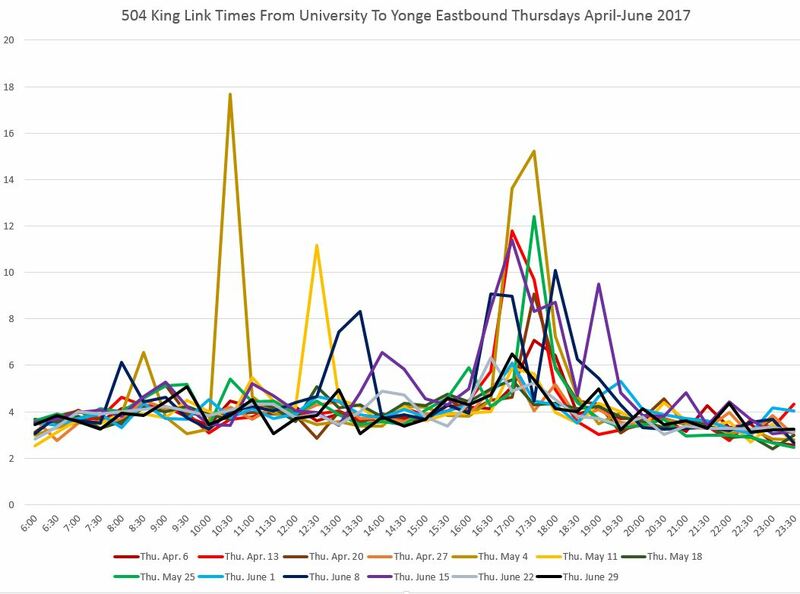 Between Yonge and University, there are peaks in both the AM and PM, although the PM peak does not behave the same way in each week. 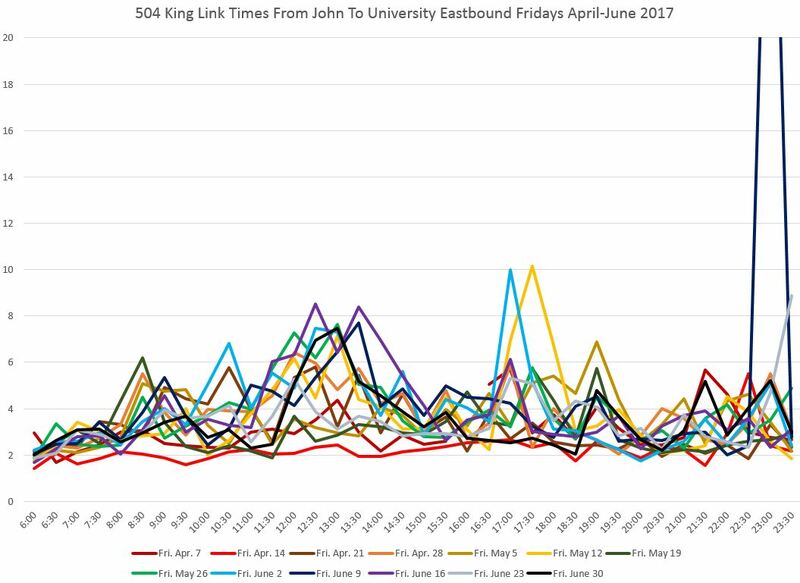 The segment from University to John includes the theatres, but the larger effect is seen after 10:00 pm when the they let out. This is a sharp peak as opposed to the gradual arrival of the audience before performances. Travel times from John to Spadina are affected during most of the day by congestion at the Spadina intersection. This can be particularly bad if, due to service disruptions on 510 Spadina, many streetcars are attempting to use Charlotte Loop. The late evening effect of the club district is quite obvious here, although this is limited generally to Fridays and Saturdays. As with the segment east of Spadina, travel times are affected by the club district. As with the westbound service, travel times in this segment rise in the evening thanks to congestion in the club district. 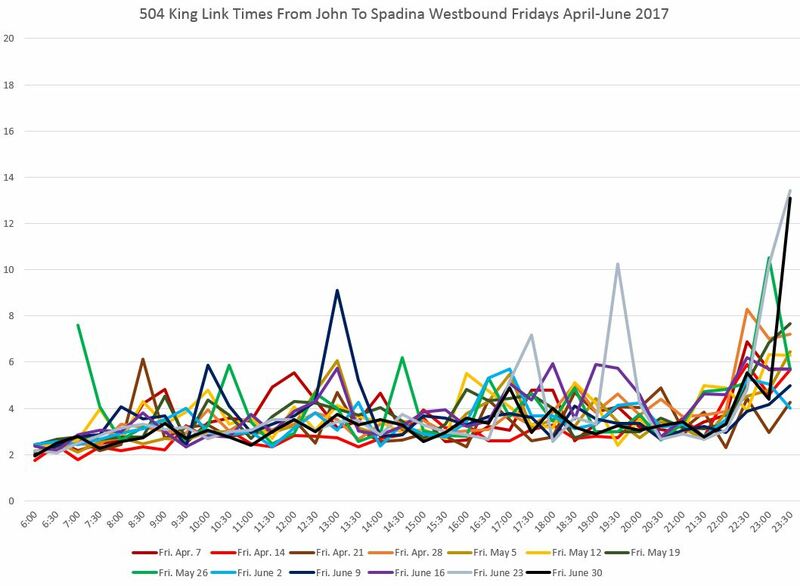 Between Spadina and John, on Fridays, there is more delay at midday than in either of the peak periods. 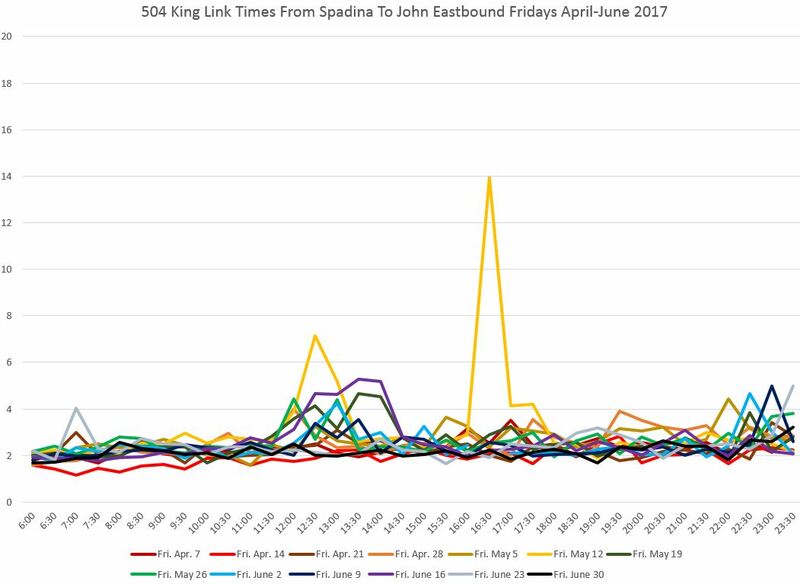 East from John Street, midday congestion is worse than the AM peak and most PM peaks. There is a smaller effect late evening from the theatres than westbound. In the financial district, the peak times correspond to the traditional rush hour although this can be spread out over more than two hours. 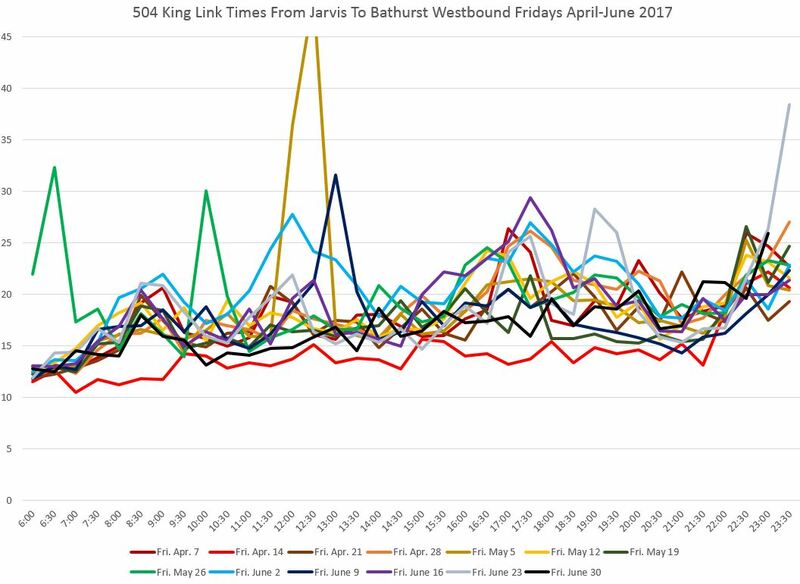 The charts below show both Thursday and Friday data to illustrate how Fridays, for regular commuting traffic, can actually be lighter than midweek days because work departure times are spread out. 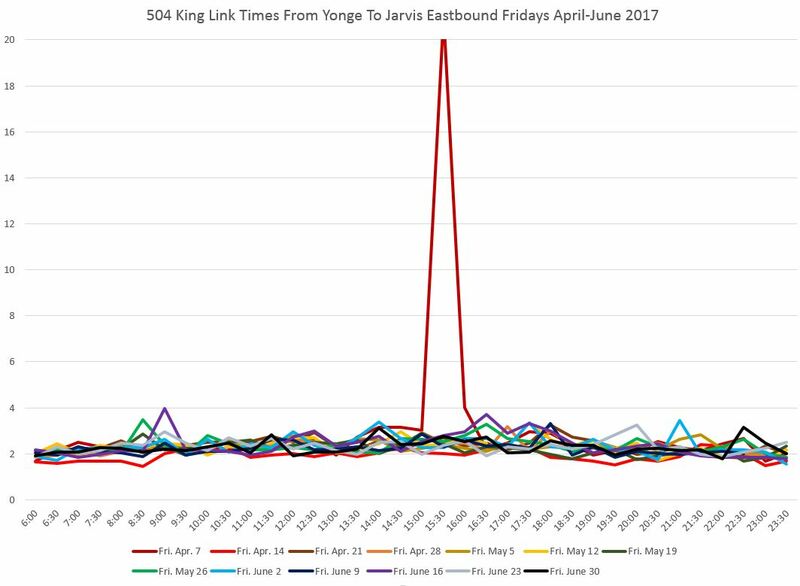 There is no congestion east of Yonge Street, and except for a delay on April 14 (ironically itself a holiday), the travel times to Jarvis are consistent all day long. This article shows the type of “before” data that, together with riding counts and traffic monitoring, can be used to set a base line against which the pilot project’s operation can be measured. There is also the question of how the pilot will affect traffic and streetcar service on Queen Street, but that’s another article to follow once there actually are streetcars back on Queen to monitor. 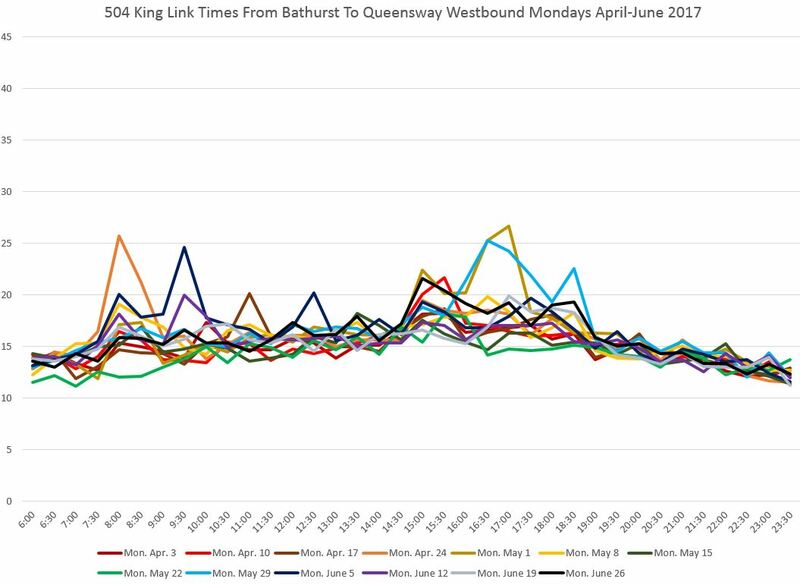 The delays on the King streetcar caused by Khalsa Day Parade (Sunday April 30) and Toronto Marathon (Sunday May 7) are really severe. Why is the city allowing these sorts of extremely disruptive events? Even when the King streetcar itself isn’t detouring, closing a main road like Lake Shore Boulevard or Gardiner causes a huge amount of car traffic overflow onto King Street and severely delays streetcars. Steve: Thanks for flagging the events causing those two Sunday delays. Yes, spillover onto King can be quite severe as on other streets downtown. So it’s clear that baseball and Friday nights in the entertainment district cause some significant delays…and clearly by limiting traffic on those streets during that time would improve things…but it appears we aren’t going to do that (at least for taxi’s)…. It’s likely with less cars that there will be more pedestrians crossing mid-block…is there any discussion in the entertainment district on better ways to manage this? Good to see the Waterfront 10K (Saturday June 17) which I mentioned in the Flexity post show up on the charts as a bunch of random spikes in the morning. I very much enjoy the idea of, and strongly recommend, Presto readers at stops. Even on the new Flexity cars there is frequently a queue of people waiting to tap on presto…it would be much quicker if they could just board. Same goes for ticket vending machines at the actual stop for busy stops, as ticket machines on the new Flexities become *extremely* busy otherwise (nevermind when one or both of them decides to go out of service…). Steve: There was a proposal to install machines at major stops, but I haven’t seen any sign of this beyond the initial rollout on Spadina/Harbourfront.